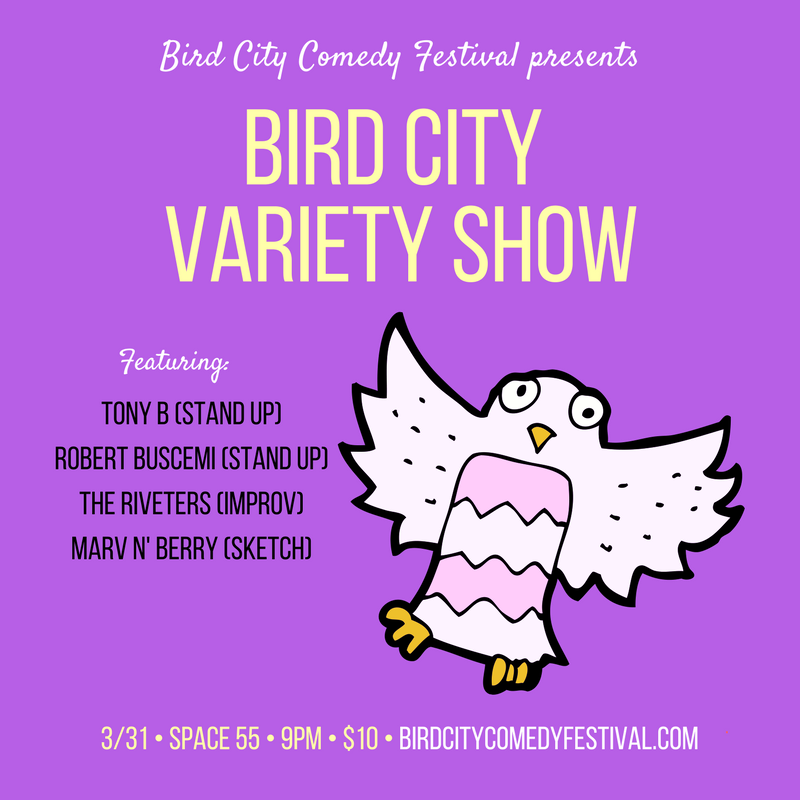 The Bird City Variety Show offers a little something for everyone! We've got stand up from Tony B and Robert Buscemi, improv from Tucson's own The Riveters and sketch from Toronto's Marv N'Berry. Tony B has been performing for over 6 years. He started in improv and eventually found stand up where he uses his skills in improv to create a performance that is spontaneous and high energy. Tony is a regular at Rick Bronson's House of Comedy and The Comedy Spot in Scottsdale, AZ and has performed in comedy clubs and festivals across the country. Robert Buscemi has two original hour-long albums on Rooftop Records: "Palpable" and "One Pretty Peacock." He appears in the Netflix film TODD BARRY: THE CROWD WORK TOUR, and KONG: SKULL ISLAND director Jordan Vogt-Roberts filmed Buscemi’s stand-up film (T)WIT: ROBERT BUSCEMI LIVE IN CHICAGO. BUSCEMI did an epic 2.5 hour interview on Pete Holmes’s "You Made It Weird” podcast, and before he moved to LA the Chicago Reader named Buscemi “Best Comic” in the city. Buscemi is a veteran of the 2017 Bird City Comedy Festival, the Bridgetown Comedy Fest (4 times), San Francisco Sketchfest, the Chicago Improv Fest, and the Rooftop Aspen Comedy Fest, and is a two-time Andy Kaufman Award semi-finalist. As an actor, Buscemi recently acted opposite Jon Voight and Liev Schrieber in RAY DONOVAN; Hugh Laurie in the HULU thriller CHANCE; and Martin Starr, Fred Melamed and Deborah Ann Woll in the forthcoming indie film SILVER LAKE. He’s also acted in MARVEL'S AGENT CARTER on ABC and PITCH on FOX. He’s run the monthly LA house-party comedy show “SURPRISE w/ Rob & Sofiya” for five years. Founded in early 2015, The Riveters is an all-female long form improv troupe from the Tucson Improv Movement (aka TIM). From a brief opening these hilarious ladies will create a montage of fun, fast, and smart comedic scenes right on the spot. The Riveters is comprised of Esther Brilliant, Clare Shelley, Jessica Peck, Catherine Bartlett, Jessica Hill, and Jessica Gregg. Marv n' Berry is a Canadian sketch comedy posse consisting of Mike Robertson, Chris Borger, Sam Stralak, Quinn Contini, and Nikki Hulowski. All members are also improvisors in Edmonton Alberta’s Rapid Fire Theatre ensemble, and thus Marv n’ Berry was formed at RFT's annual Bonfire Improv Festival (a celebration of experimental improv formats). After creating an hour-long sketch showcase in a week, they emerged fully formed as a quintet of dedicated sketch performers. Since then, Marv n’ Berry has been traveling throughout North America doing improv and sketch: recently performing in Hell Yes! Fest in New Orleans, Vancouver Sketch Festival in British Columbia, Canada, Charm City Comedy Festival in Baltimore, Sac Comedy Fest in Sacramento, California and many more. Additionally, Marv n’ Berry had a critically-acclaimed four-star sold-out run at the Edmonton International Fringe Festival in 2016 with their show “Marv n’ Berry presents: Is Everyone Ignoring Me or Am I Just a Ghost?” and did it again in 2017 with a new show called “Imagination”. From high concept to low brow, Marv n’ Berry performs with no boundaries, dippin' their fingers in all the comedy pies. Their shows feature sturdy sketch premises that contain some silly improvised riffing, as well as some absurd character work and some fourth-wall breaking audience interaction sketches. Their show is generally minimalist, with barely any props or video cues; just lights, sound effects, chairs, and jokes.